The Pro Tools Dock is a hybrid touchscreen work surface for use with your iPad and the free iPad app Pro Tools Control. The EUCON control surface brings together workflows from the Pro Tools S6 and the Artist | Control to provide intelligent studio control in a portable, ergonomic and affordable suface. Pair with Pro Tools S3 to gain new timesaving touch workflows and custom control. 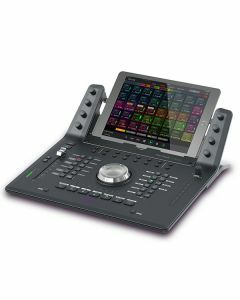 For use with and iPad and the free iPad app Pro Tools Control, the Avid Pro Tools Dock is a fusion touchscreen work surface. Delivering intellectual studio control in a moveable, ergonomic and inexpensive surface, the EUCON control surface combines workflows from the Pro Tools S6 and the Avid Artist Control. To add new streamlined touch workflows and custom control, consider coupling the Pro Tools Dock with the Avid Pro Tools S3. Mixing can miss physical feedback with just a touchscreen, or become monotonous with a keyboard and mouse alone. However, the Avid Pro Tools Dock gains unparalleled navigation pace and tactile accuracy to build better sounding mixes with a combination of touchscreen, fader, knob, and switch control. Create custom macros to execute complex procedures instantly, skip to any track or section with a touch and mix with your ears—not your eyes—with ergonomic controls you can feel at your fingers. With the Avid Pro Tools Dock and your iPad you can enhance creative opportunities - leave limiting yourself in anyway, whether that’s to a single application, workflow or industry, in the past. Get wide-ranging Pro Tools integration. Manage every component part of a production from start to finish. Work with different software tools in tandem as opposed to porting projects. Mix music and audio post, and boost video projects. Powerfully extend the capabilities of the Pro Tools S3. All from one amalgamated control surface. Realise extraordinary control of Logic Pro X, Cubase, and other EUCON-enabled DAWs while experiencing the deepest level of integration and command with Pro Tools and Pro Tools HD. The Dock instinctively modifies its controls to the application in use on your workstation because it is EUCON-aware. Alternatively, can isolate parts of the surface to specific software for multi-application control.